Jack Rechcigl is recognized internationally for his research on the beneficial uses of industrial by-products as fertilizers for agricultural crops. The primary focus of Rechcigl’s research has been on evaluation of the fertilizer requirements for pasture grasses and legumes and determination of the effects of the fertilizer amendments on surface and groundwater quality. His studies have conclusively shown that there is no economic advantage from applying phosphorus and potassium fertilizer to bahiagrass. 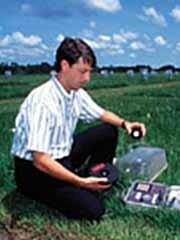 As a result of his work, fertilizer recommendations have been revised, eliminating the need for phosphorous and potassium fertilization on major pasture grasses grown in Florida. These revisions have saved Florida cattle producers millions of dollars in fertilizer costs. He is currently extending his studies to other forage grasses. Rechcigl has also successfully assessed the potential uses of various organic wastes and industrial by-products as fertilizers. Through the support of a million-dollar grant, he has evaluated the potential of using phosphogypsum (a waste product of phosphate mining) as a source of nutrients for crops. These results have generated tremendous interest both in the agricultural and the environmental regulatory community, as well as in international agricultural circles, which has led to invitations for Rechcigl to speak about his research findings in a number of countries. Several of these countries are now using phosphogypsum as a fertilizer where, in the past, it was dumped in the ocean as a waste. He has also been invited to give keynote addresses at several prestigious symposia on the utilization of inorganic and organic wastes in agriculture. Rechcigl’s research has generated more than $3 million in grants. He has authored more than 200 publications, including contributions to books, monographs and articles in periodicals in the fields of soil fertility, environmental quality and water pollution. He has also initiated and is currently the editor-in-chief of the Agriculture and Environment monograph series and has edited six comprehensive treatises on diverse agricultural topics. Rechcigl has received numerous awards, including the Sigma Xi Research Award and the University of the Philippines Research Award, and he was recently elected a Fellow of the American Society of Agronomy.